Congregation Beth Ahabah is celebrating its birth and growth in Richmond, Virginia during the Jewish year 5774 (2013-2014), marking 225 years of active, inspirational, and devoted worship and learning. Over these years much had changed in our fair city. In 1775, Patrick Henry delivered his famous “Give me Liberty or Give me Death” speech in St. John’s Church, during the Second Virginia Convention. This speech is credited with convincing members of the House of Burgesses to pass a resolution delivering Virginia troops to the American Revolutionary War. In 1780, Virginia’s state capital was moved from Williamsburg to Richmond. In 1781, under the command of Benedict Arnold, Richmond and its port at Warwick was burned by British troops. Richmond quickly recovered and was incorporated as a city in May 1782. In 1785, the James River Company was created and the development of the James River and the Kanawha Canal – designed by George Washington – ensued. Designed by Thomas Jefferson, the Virginia State Capitol was built that year. These events led to further development of the economy of the city. The first bridge across the James River, named Mayo’s Bridge after the founder of the city, was built in 1787. The Virginia Statute for Religious Freedom, written in 1779 by Thomas Jefferson, was passed in Richmond on January 16, 1786. Its importance is recognized annually by the President of The United States, with January 16 established as National Religious Freedom Day. The Bill of Rights was instated in the Constitution one year later, in 1787. With this backdrop, the first Jewish congregation in Richmond, Kahal Kadosh Beth Shalome, was founded in 1789. Kahal Kadosh Beth Shalome was the sixth Jewish congregation in the United States. By 1822, K.K. Beth Shalome members worshipped in the first synagogue building in Virginia in what is now an active and vibrant downtown area. Askenazic Jews founded Congregation Beth Ahabah (House of Love) as an offshoot of K.K. Beth Shalome in 1841, and in 1898, K.K. Beth Shalome formally merged with Beth Ahabah. 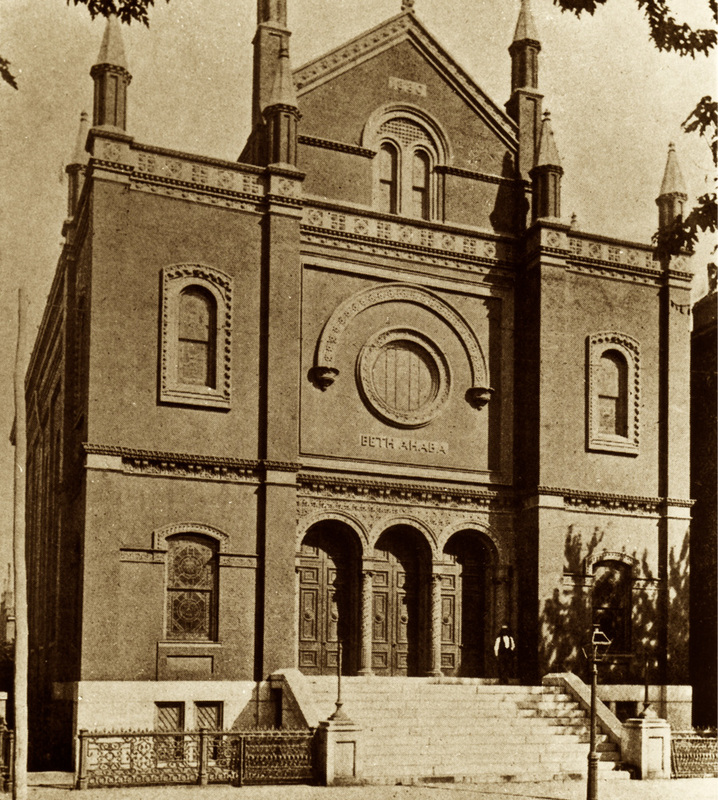 In 1904, Beth Ahabah consecrated a new synagogue in the then burgeoning suburbs of the Fan District near downtown Richmond. This structure remains the home of a congregation of nearly 700 families. Beth Ahabah will be celebrating this heritage and history throughout this year, including a scholarly retreat hosting Dr. Jonathan Sarna, Professor of Jewish Studies in the department of Near Eastern and Judaic Studies at Brandeis University. Other events include a retrospective on Reform Movement prayer books, special musical celebrations, the burying of a time capsule, the collection of oral histories from our seniors, re-Koshering the KK Beth Shalome Torah scroll and various birthday-style celebrations. Members of the Congregation consider it a great honor and privilege to continue the traditions of our Temple founders.